Bridgman, L. J. (illust.) 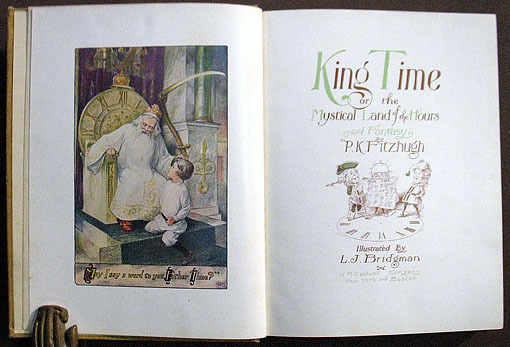 / Fitzhugh, P. K.
King Time or the Mystical Land of the Hours. A Fantasy. New York and Boston: H. M. Caldwell Company, (1908). ￥57,000 (税込み) 22.4 x 17.5 cm. 233 pp., with color frontis. and 7 plates. Full tan cloth, stamped in decorative gilt, blue, navy and terra-cotta, covers and some internal soiling, a marginal tear repaired.